In the illustration only the arm, can be seen at full length, but the face and shin are sloping in the same direction and thus have the same small degree of foreshortening. The length of the arms, shin, and head can be satisfactorily coordinated, and then the shoulder breadth, of which the foreshortening is rather restricted, can be fitted to it. The more the body is turned away from a frontal view the stronger the foreshortening in perspective, which must be rendered with the help of geometric figures, not a linear scheme. 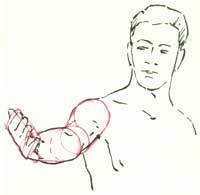 If an arm is stretched out towards the artist, he needs to be very experienced to interpret it correctly at sight. The inexperienced artist should proceed by encasing the upper arm in a cylinder, the forearm in a truncated cone, the joints in conic sections, and the hand in a slightly curved rectangle with small truncated cones for the fingers. The same can be done with all other parts of the body: the head becomes an egg shape with meridians to indicate the features and the trunk a barrel describing an oval section. It is a useful exercise to study these figures, with their foreshortenings in perspective, by treating them as though they were transparent. This trick is the easiest way of making clear the relative positions of the parts of the body. 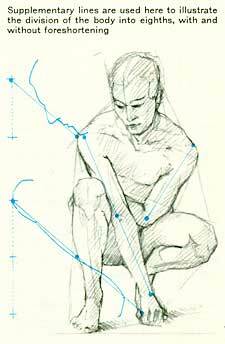 It is usual to insist on the beginner's using cuboid figures for the human body delineated with a harsh, angular line, making him avoid sweet and soft, rounded contours. This method has the disadvantage of making the artist turn people into robots, thereby losing his feeling for the roundness of the body. Severity of line is a discipline that can be practiced in other ways. Exercise in perspective has taught us that the variety of vanishing points increases with the diversity of the shapes of the individual bodies. The same applies to the guiding figures used now in life drawing. It is not appropriate to work out a large series of constructions for this work. Architectural studies are the best means of developing a feeling for perspectival relationships, and this feeling should be sufficient in life drawing. Architecture is closely allied to the structure of the human body. Nowhere else is man so much the measure of all things as in architecture, which is, therefore, at its best when based on the proportions of the golden mean. Drawing architecture is useful for developing the sense of stability so necessary in life drawing. An understanding of the containment of space in architecture also develops a feeling for the space in which the body is contained. The only way of establishing the position of the body in relation to the artist is by enclosing it in a cubic structure. He imagines it in a glass box, the walls of which touch the outermost points of the body. This approach clarifies the foreshortenings and ambiguities caused by perspective. If this boxed man is approaching the - artist, the reduction in size of the hinder parts of the body can be worked out from vanishing lines. The horizon and positions of the vanishing points provide a useful check on the direction and stability of the walking figure. This imaginary guide is used not only by beginners but even by the greatest artists from time to time.